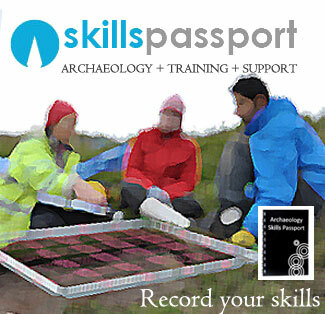 The Archaeological Skills Passport is a means of documenting the practical training that students and volunteers receive either during the course of an undergraduate degree or any archaeological fieldwork or project that they may be involved in. The passport contains a list of the practical skills and techniques that will be of benefit for those wishing to pursue a career in archaeology. Where these individuals seek to gain training in these various modules you will be asked to assess their performance and assign a general level of competency before signing off their skill. The individual should alrady have filled in all the relevant details in their passport, including the project section and you will need only sign and tick the relevant skill – making the process as quick as possible. The main criteria to consider is the genuine ability of the person, and you should never sign off somebody above their level – this will not benefit them, and will reflect on your training. The other important point is to be aware of your own ability, and only train people in areas that you are competent. The criteria is simple, based on; Needs full supervision; Needs some help; Needs no further prompting. Novice: The individual has had experience of undertaking the particular task and understands the principles behind the task but requires constant supervision. Competent: The individual is able to undertake the task and understand the concepts with only limited assistance, but still may require prompting. Proficient: The individual can undertake the task with little or no help and can even assist or advise others to help them understand the principles. Some of the skills refer to the use of particular tools or items of equipment ranging from buckets to total stations. As a minimum the individual should be able to use the particular tool for the task it was designed to do. For excavation equipment, such as shovels and mattocks, this should involve the careful and considered use of the tool as well as cleaning/excavating in a manner that is safe both for the person using it and those around them. For survey equipment, such as dumpy levels and total stations, the individual should demonstrate at least a basic understanding of how the instrument is set up as well as its basic operation, and the proper maintainace of these instruments. Other skills refer to tasks that the individual may be asked to undertake during the course of their fieldwork, such as stratigraphic excavation, topographic survey or public engagement. The individual should demonstrate a basic understanding of what they are doing and why they are doing it. Obviously some techniques are easier to master than others and this should be reflected in the individual ’s assessment. Whilst it will be an unusual individual who can not become quickly proficient in the use of a bucket (though we all know one) most will take time to become proficient in stratigraphic interpretations or total station survey. Their progression can be charted over the four separate training sessions they require for each task – over four separate projects. Thank you for taking part as a skill trainer, you are creating the next generation of archaeologist, and please feel free to comment and email me suggestions that can be integrated into further editions.